I was four years old when this photo was taken, probably around 1954 or 1955. I remember that day, a bitter Sioux City winter, snowy and bone chilling cold. 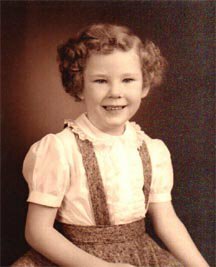 Mo, my grandmother, packed that crinkly blouse and gray felt skirt into a cosmetic case, helped me into dungarees, and bundled me into a red snowsuit. My permed hair was flat against my skull, tamed with black bobby pins. I don't remember much about posing, just repacking the outfit, bundling up again, and going home. I don't know why that day was so memorable--maybe it was the last time I felt special in my own family. As a teenager, I used to study this picture, envying my early childhood skinniness. How pathetic is that? In 2005, that photograph represents a time in my life when eating had no warped issues attached to it, and the tiny body mirrored back to me reflects that simple time. I was skinny up until about age six, when I became a little chunky. Not fat, mind you. But I remember my mom's and grandmother's alarmed conversations about my fat. Never mind that Mom had a serious drinking problem (among other problems). In our family, a fat child was an unacceptable commodity; alcoholism was the norm--at least that was my perception. Quite a bit of junk for 30 cents. It's no accident that sunflower seeds have made my top ten list of favorite foods, but my tastes have matured, and I now prefer them shelled and unsalted. I even developed a hierarchy of how the foods were to be eaten, starting with the Lick-em Aid. It was sweet and tarty, so it had to be consumed first. Then I chewed one of the orange gumballs, until all the sugar was gone, and then I'd spit it out, and pop in the grape gumball, and continue with the second orange gumball. I pretty much stuck with the order noted as above. Why? Who knows...? At the time it seemed important to establish a binge routine. My grandmother spent a lot of energy trying to root out my stash, but most of the time I ate it before she could get her hands on it. Food was so important that I, a Catholic girl, once considered selling my soul to the devil just so I could eat all the peanut butter cups I wanted without getting fat, but I stopped short of actually conjuring up the Prince of Darkness. Had I known about purging to stay thin, I probably would have done it. Beats selling one's soul for such a pittance. When I went on my first diet, I was eight. By the time I was nine, I was popping little pink pills that killed my appetite, but they made me crawl the walls, so our family doctor prescribed sleeping pills so I could sleep at night. I hated them because I felt stupid on them, so I would pretend to take them but then spit them out when my grandmother turned out the lights. No one could figure out why I was still bouncing off the walls. By the time I was 11, no one had to tell me to diet; I was doing it on my own, happily scarfing down those pink and gray pills and alternating between bingeing and fasting--either on a diet or on a binge. No middle ground. The teenage years. I was totally out of whack; I had lost the ability to discern hunger, a problem that has dogged me ever since. I'm just now beginning to sense my hunger and satiety cues, but it's still an uncertain process that will take time before becoming second nature. Anyone who says this process is a quick fix is in denial. Anyway, I'm going to try posting this photo on the first page of this blog. I think it's small enough. I want people to know that we don't start out life as fat people--for some of us, something happens along the way, and our bodies begin to betray us. Thanks for your thoughts, Lisa! Thanks, Lisa, for your thoughts!